People say that fika is the Swedish way of life. The Swedes love fika, sometimes 3 times a day like we eat food 3 meals a day: two mandatorily at work and possibly another one in the evening if you’re at a guest dinner. Fika is more than just having a cup of coffee, it’s also sitting down together and having a chat, most of the time with some sweet treats like a kanelbulle (cinnamon bun) or a chokladboll (chocolate ball). The word fika is actually a reverse of the word kaffi - means coffee, minus one extra f. Swedes, with their big love for coffee, invented the word to refer to their secret coffee meet-ups when drinking coffee was actually banned during late 1700s. And now, the Swedes have made it an irreplaceable part of their culture. Fun fact: Swedish King Gustav III was an extremist in opposing the consumption of coffee, first by imposing hefty tax on coffee, then by banning all coffee in Sweden. King Gustav III even ordered an experiment on a pair of criminal twins trying to prove negative health benefits of coffee, where one of the twins drank 3 pots of tea every day for the rest of his life while the other twin drank 3 cups of coffee every day. Ironically, both twins outlived the doctors who monitored the experiment, and also the king himself who was assassinated in 1792. And as it turned out, the coffee-drinking twin lived longer than the tea-drinking twin, though both of them actually lived very long. Growing up in a coffee exporter country, I have a love-hate relationship with coffee. And my love for coffee is not even as big as a normal Swede. In fact, my tolerance to caffein is close to zero. People drink coffee to not become a zombie, meanwhile, I become a zombie whenever having non-decaf coffee. And I didn’t even mention that coffee is a bad idea for my sensitive pray-to-god-that-i-dont-have-an-ulcer stomach. Poor King Gustav III should have taken someone like me as the lab rat instead. For the taste, I’m all for Vietnamese Robusta coffee, which is an unfortunate fact as Arabica coffee is the main biatch here in Sweden. Am I the only one who prefers the generally-considered-inferior type of beans? Actually I would like to make a case against this nonsense presumption. I think different types of coffee beans have different flavors and characteristics and none is superior or inferior to the other. It’s a matter of taste preference, simple as that. 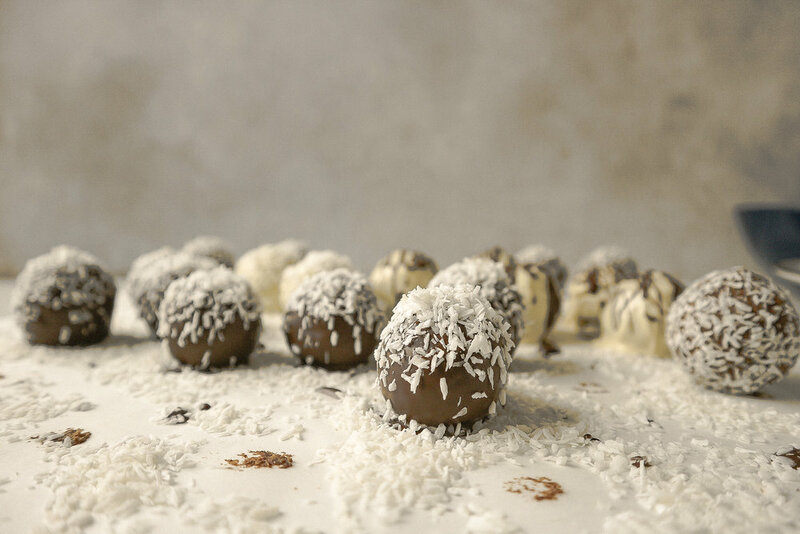 Enough talking about coffee, today I want to share the recipe for a Swedish treat that usually accompanies fika time: Chokladbollar! 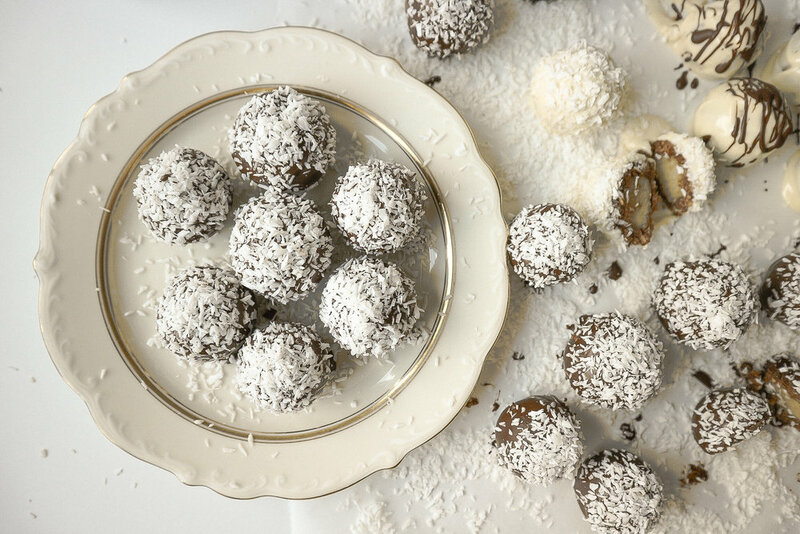 (Literally: chocolate balls). This treat is super tasty and super easy and fun to make. The basic recipe uses sugar, no marzipan filling and no chocolate cover but I opted for dates instead of sugar just because I think that it’s a bit less evil than pure sugar and I wanted to have marzipan fillings (Christmas is coming after all!) plus cover mine with chocolate so it is less boring. For marzipan, don’t even bother thinking about making it yourself, just grab one package from any supermarket and you’re good to go. I also had a bit fun trying to coat the balls with white chocolate, which turned out super nice too, although it takes longer for the white chocolate to set so you’d better not touch it after 1 hour or 2 just to make sure that you don’t ruin it. Fun fact 2: Chokladboll was called Negerboll (means n*ggar ball) before, yet due to its racism controversy, the term negerboll is not in use anymore nowadays. Mix in oats, cocoa powder, vanilla sugar, coffee, salt. Beat for at least 5 minutes until the oats are fully incorporated in the mixture. Chill the mixture in the fridge for at least 1 hour. Break dark chocolate into small pieces and melt over a double boiler. Cut the marzipan into thumb-size pieces. Roll into small balls. Cover the marzipan balls with oat mixture and roll into chocolate balls with the size of your choice. Coat the chocolate balls in melted dark chocolate and put them on a sheet of baking paper. 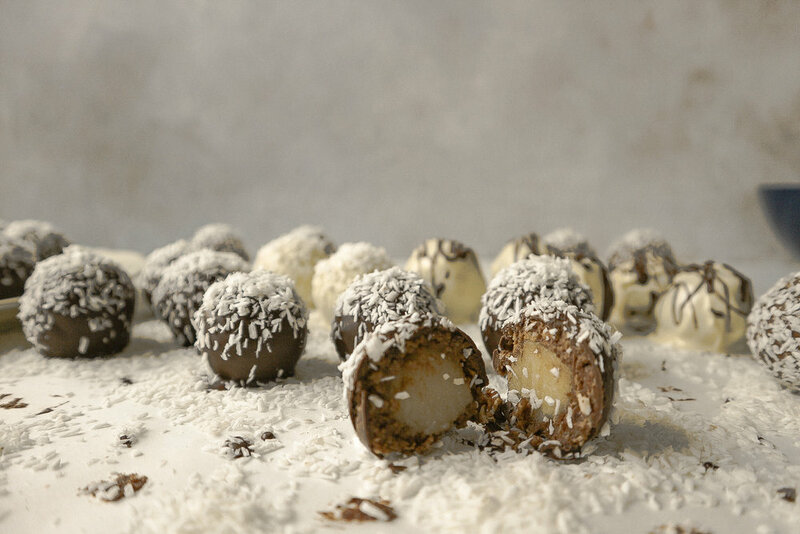 Sprinkle coconut flakes on top before the chocolate cover has time to solidify. Chill in the fridge for 1 hour before serving.